Doesn't sound very fast. Also sounds serious. Manchego y Chorizo Tapa con Membrillo Does it sound any simpler in Spanish? So, in 60 seconds, you spread a layer of membrillo on a toast or cracker. 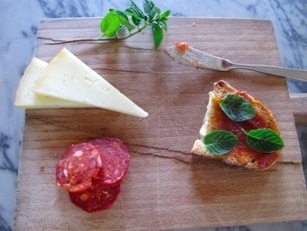 Arrange a few mint leaves over the membrillo, top with a couple of thin slices of chorizo (I like Espanola's Cantimpal or Fra' Mani's Chorizo) and top with a piece of Manchego. Repeat until you are satisfied.